It’s pretty amazing to think about Rachel Cartland’s early adult years. She came from modest means and graduated from Oxford in her early twenties. In 1972 she entered the job market. For a woman back then, the opportunities were limited. But Cartland successfully interviewed for the administrative grade of the Hong Kong government. She had never been to Hong Kong before she flew there to start her job. In Paper Tigress: A Life in the Hong Kong Government (Blacksmith Books, 2013), Cartland writes about her four decades in the Hong Kong government. 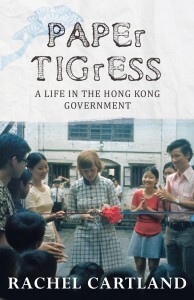 I studied government and public administration in Hong Kong, but I would have devoured this book no matter what. What stuck with me the most was how the civil service has changed throughout the years. In the cover photo, Cartland is participating in a ribbon cutting ceremony in Kowloon City. She was out in the field here and in the New Territories. But as she writes in the book, civil servants now mainly stay behind a desk in a comfortable office on Hong Kong Island. I was also impressed by how well British and local Cantonese civil servants seemed to work so well together. Cartland mixed just as well with her local colleagues as her British ones. What I also love about this book is how it takes the reader through modern Hong Kong history: from Hong Kong’s transformation from a manufacturing economy to a service industry-based one; from Margaret Thatcher’s visit to Beijing to the signing of the Joint Declaration; from the brain drains of 1984 and 1989 to a renewed confidence in Hong Kong as a permanent home and not a transit stop; and finally from the 1997 handover to the early years of the SAR (Special Administrative Region). When I finished the book, I was sad it was over. But I was also sad Cartland’s career had ended. She gave her all to Hong Kong and saw it through some tough times. And Hong Kong has definitely shaped who she is today. Thank you so much for a very perceptive review, Susan. I hope that people who have never visited Hong Kong might enjoy it too. I set out to make the story as accessible as I could. Hong Kong has its imperfections but I’m still here and still fascinated by it!